More than 15 years in, this acclaimed Inglewood restaurant continues to impress with its French cuisine featuring local ingredients. Rougie duck breast at Rouge. Photograph by Jared Sych. Join us for dinner at Rouge on September 18. We’ll tour the restaurant’s backyard garden and learn about how the simple ingredients are elevated in fine dining dishes. Then, we’ll sit down for a multi-course meal that makes the most of those garden fresh ingredients. FOOD | French dishes prepared with local ingredients and flair. VIBE | Formal, yet comfortable. DECOR | Upscale heritage home with local artwork. 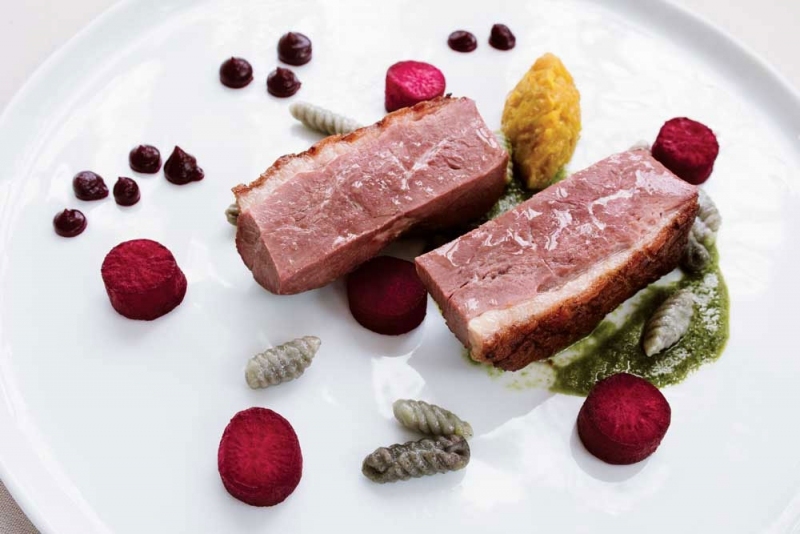 DISH | Rougie duck breast. TIP | Have breakfast for lunch any day – both eggs Benedict and a sublime daily quiche are on the menu. Since it opened in the historic Cross House in 2001, Rouge has received more than its share of accolades – in Avenue and in publications near and far, as well as being recognized by the S. Pellegrino list as one of the top 100 restaurants in the world in 2010. Chefs in Calgary seem to have been playing a game of musical chairs of late and when the music stopped most recently – at the end of February – Darnell Japp was in the chair of chef de cuisine at Rouge, joining chef/co-owner Paul Rogalski to lead the kitchen. Rouge plays with the idea of what a fine French restaurant can be, pushing lightly on traditional techniques with local ingredients and flavours. Rogalski also incorporates light touches of inspiration from elsewhere, especially for special-event menus. The food and feeling at Rouge ventures closer to formality than most Calgary restaurants these days. You will find not only cloth napkins but tablecloths as well, for example, and Rouge’s menu features a charcuterie plate and also a foie gras terrine. But by focusing on service and fresh ingredients – many from its own garden in season – Rouge stays on the comfortable side of fussy, with carefully executed dishes in a beautiful space giving every meal a sense of occasion.